Over 350 dinner guests attended at the prize cermony when the Detektor International Award dinner was held in conjunction with the opening day of Sectech in Stockholm on the 20th of October. The eleven awarded finalist products were chosen on basis of both innovation and customer orientation. Winning products need to be smart as well as useful. 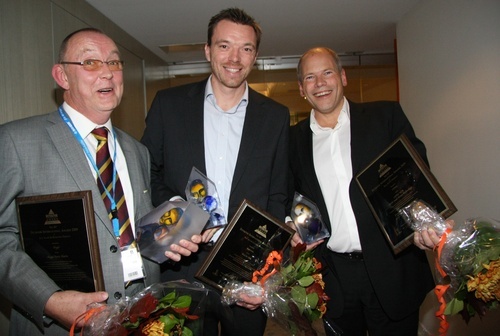 Christer Freander of Skygd AB, Rasmus Pedersen representing Suprema (Vitani A/S) and Matts Lilja of OPAX, were all happy to receive the Best Product Award in their respective product categories. This was the 10th annual Detektor International Award prize ceremony, this time held at the Sectech Sweden exhibition in the Swedish capital Stockholm. Sectech Sweden was also the location for the two day Sectech expo, focused as always on security technology, where around 100 companies exhibited. Lennart Alexandrie, CEO for AR Media International, the publishing company behind Detektor magazine, together with Tom Curry, Detektor's North American associated publisher and editor, were the masters of the ceremony. The Best Product Award in the Access Control category went to Suprema for its outdoor fingerprint terminal BioLite Net. The jury's motivation was "The BioLite Net Outdoor Fingerprint Terminal offers not only an instant identification for access control and time attendance, but it is also designed to withstand harsh weather conditions. Combined with its sleek and compact design, BioLite Net respond perfectly to market demand for security, quality, functionality and pleasing aesthetics. BioLite Net is truly a winning concept for 2009." The Highly Commended Product Award was awarded to the Code Handle 8810 - A handle with integrated code functionality from ASSA OEM (Sweden). The jury's motivation was "With the ASSA Code Handle 8810 the market has been blessed with a non-obtrusive electro-mechanical code handle that suits almost any indoor environment. Simplicity in installation, design and use clearly points to an effective solution for settings, such as offices and retail shops, schools, hospitals and even homes. A triumph for Scandinavian aesthetics and smart design." The Innovative Achievement Award in the Access Control category this year went to HID on the Desktop, a solution that turns a physical and logical access control into a single integrated solution, from HID Global (USA). The jury's verdict was "The HID on the Desktop package seamlessly turns a physical and logical access control into a single integrated solution. Simple and convenient use, easy installation and maintenance, together with reliable and secure operation are the key characteristics of the HID on the Desktop solution. With this product HID has once again made an important contribution to the management and improvement of security throughout commercial and public organisations." The Best Product Award in the Alarm and Detection category went to the Skygd Panic Alarm, a panic alarm software for standard cell-phones from Skygd (Sweden). The jury's motivation was "Advanced panic alarm devices are commonly using a dedicated transmitter/sender while the advanced Skygd software is using a standard cell-phone as the alarm unit. This approach not only significantly increases the market potential of Skygd, but also the likelihood that the user is carrying a device that is well-charged and available to hand when a situation of threat occurs. Smart and smooth - a brilliant concept!" The Highly Commended Product Award in the Alarm and Detection category was given to RLS-3060, a laser scan detector from from Optex (Japan). "The RLS-3060 laser scan detector's ability to detect the size, speed and distance of a moving object and process this information through a special algorithm, results in a highly reliable security solution that also minimises false alarms. The versatility and sophisticated detection technology makes the RLS3060 a great tool for a wide range of applications and provides an excellent example of today's advanced security technology solutions." The Alarm and Detection Innovative Achievement Award was awarded AdvanceGuard 350-X, a radar sensor for perimeter security protection from Navtech Radar (UK). The jury's motivation was "Early detection of intruders is the most important key to an effective high-security environment. The AdvanceGuard 350-X radar sensor clearly meets this demand in perimeter security applications with a convincing accuracy." The Alarm and Detection Innovative Achievement Award was awarded DD669 AM, a dual detector with 360 degree coverage from GE Security (USA). The jury's motivation was "With 360 degree detection, an advanced Anti Masking technology concept and an impressive installation flexibility, GE Security has set a new standard with the DD669 AM. Furthermore the concept of this detector is strengthened by the range controlled radar that ensures that objects outside the detection pattern do not produce false alarms. A remarkable product for several indoor security applications." The Best Product Award in the CCTV category went to OPAX VCA with Saab Stereo Technology, an enhanced VCA solution based on Stereo-technology, from OPAX (Norway). The jury's motivation for the award was "With the OPAX VCA and the innovative Saab stereo technology, efficient intelligent video surveillance can successfully be used in several different security and safety applications. Excellent!" The Highly Commended Product Award in the CCTV category was given to SNC-RH124P, the world's first PTZ HD camera from Sony (Japan). The motivation of the jury read "As the world's first HD PTZ camera the Sony SNC-RH124P packs all the features associated with a high-end network camera and shows Sony's commitment to be a world class manufacturer of IP video surveillance products." The Innovative Achievement Award of the CCTV category went to AXIS P3344, a HD indoor fixed dome camera from Axis Communications (Sweden). The jury's motivation was "The AXIS P3344 HD indoor fixed dome camera marks a significant step towards a world of optimised video surveillance image quality, based on HD video and advanced remote configuration." The Innovative Achievement Award of the CCTV category went to NBC-255-P, a complete network video surveillance system from Bosch Security Systems (Germany). The jury's motivation was "With the NBC-255-P IP camera Bosch Security Systems proves its ability to develop and produce high quality out of the box network surveillance solutions that appeal to a mass-market." In each product category the best product was awarded the "Best Product Award", the second received the "Highly Commended Product Award" and number 3 and 4 received the "Innovative Achievement Award". The jury consist of total 9 members from 6 different countries that all are represented in the editorial board of DETEKTOR, as well as an external independent consultant.